In my new Course "Total Heart Mind Body and Soul Makeover" you will learn how to create the mind body spirit connection by creating a Mind with Heart. This article is the first part or introduction to the new Course. 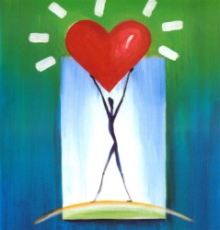 To learn how you can create a Mind with Heart please Join the Foundation for Creating A Mind With Heart. Membership is free. A fellow teacher and friend of mine once told me that the Bible phrase, "In the Beginning" could be interpreted as "In the Mind" (read "The Secret Triangle" by Rebecca Lynne). So let's begin with the Beginning - the Mind. The human mind has been the fous of philosophers, scientists (neuroscience is even a popular topic in some TV shows today), and new age thinkers for as long as humans have been self-aware. I can't even begin to touch on all that has been said, written, tested, proven and disproven about the human mind. What I can talk about here, and what is relevant to this Course, is the relationship between the Mind, the Heart, the human brain - and how that all comes together to create our life experience. The easiest way to understand all of this is probably to work our way backwards, and begin with the human brain. People who subscribe to a materialistic view of reality will claim that the brain is the creator of the human mind. The brain is a receiver of electromagnetic and chemical signals that cause particular parts of the brain to become active, creating images and sensations that we experience as physical reality. We are, in fact, experiencing the brain's interpretations of the signals it receives. There are several problems with the materialistic model. First, if our physical life experience is an interpretation of reality created by an organ we call the brain, then how can we ever truly know what the brain is interpreting? Second, research has shown that certain aspects of the mind, such as memories, are not recorded or stored in the brain. If they are not in the brain, and memory is stored in the mind, then the brain cannot be the originator of the mind. Finally, documented human experiences such as near death experiences, out of body experiences, and remote viewing (which technically are all the same thing under different circumstances) all occur when the brain is in a dormant or inactive state. If the brain is creating the mind, these experiences would not be possible. The religious view of the human mind is that it is a discreet entity, or "Soul", created by God and subject to his judgement and laws. From this point of view the human mind and the Mind of God are seperate entities with separate, and often conflicting, intentions and desires. One of the most serious drawbacks of this model is that it allows us to believe that we can be separate from God. This also makes it possible to believe that there is no God, or Creator, or Source. If you are taking this Course then I assume you at least believe that there is some kind of Source or Creator of all that exists. Maybe you have felt aware of or connected to that Source at times in your life, and know the power of that conscious connection. Or maybe you have never had that experience and desire to create it now. Finally, there is the spiritual or metaphysical view that there is only one Mind and that each of us occupies a point of view within that One Mind. Here's where it can get pretty complicated, so I will try to keep it as simple as possible and still provide a useful model. First, according to quantum physics (which is our most recent development in science) particles can exist in more than one place at the same time. Now imagine, just for a moment, that the "One Mind" (or Mind of God) is a "zero point" which is simultaneously infinitely small and large at the same time. Now imagine that "One Zero Point" or One Mind existing in infinite places at once all within itself. I told you this could get complicated. What if each of us is a point of awareness or consciousness - a zero point - within the "One Zero Point" which is the Mind of God? What would that mean for our lives and our existence? It would mean that each of us has within us a "zero point", and that zero point is not only our connection to the One Mind, God, Source, it is also a holographic image, complete and intact, of that One Mind, God, Source. And where can we find that zero point that connects us to Source and Who We Really Are? It is located in the Human Heart. Not the brain, which is a machine that receives and interprets signals. You will find it in the Heart. The human Heart was once thought to be a muscle that pumps blood throughout the body. However, in the past twenty years research indicates that the human Heart is much more. The Heart is the first organ to form in the human fetus. When it starts to beat it generates an electromagnetic field that extends at least fifteen feet out from the body. This field contains energy and information that triggers cells in the body to perform in ways that create all the other organs and systems required for life. The Heart also sends signals to the brain. Depending upon our emotional state these signals will either be "coherent" creating healthy activity in the brain, or incoherent (like static) creating unhealthy stress and dysfunctional thinking and behaviour. What causes the Heart's electromagnetic field to be coherent or incoherent? 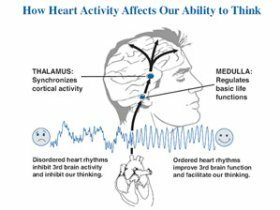 Research by the Institute of Heartmath shows us that feelings of gratitude, appreciation, well being and joy result in a coherent Heart field and a healthy functioning brain. Feelings of anger, frustration, and despair cause the field to be incoherent and cause dysfunction in the brain. So where do we get these feelings, and how can we create positive emotions that satisfy the Heart and give us a healthy mind? To answer that question we have to back track a little bit. At the beginning of this article I mentioned my friend Rebecca sharing her experience that a phrase in the Bible, "In the Beginning" could be interpreted as meaning "In the Mind". The rest of that phrase is, "In the Beginning God created Heaven and Earth." Rebecca goes on to explain that "In the Mind God created Heaven and Earth". Heaven is the perfect image or idea of creation. Earth is the physical manifestation of that image. So where is Heaven? In the Mind. What does this have to do with creating Heart coherence, a healthy functioning brain and Mind, and a fulfilling life experience? Everything. Remember the spiritual and metaphysical model of Mind where there is only One Mind, the Mind of God. And that Mind exists simultaneously in infinite locations within itself. That Mind is in you. And in that Mind is Heaven, the perfect image for you and for your life. When you access that image it creates feelings of joy, appreciation, well being and infinite abundance. Once you accomplish that task, the brain begins to create those images and feelings as your physical life experience. Some call it the "Law of Attraction". But it's really the Law of Creation. And you/God are the Creator. By now you might be thinking this is all so esoteric. What could it possibly have to do with real life challenges and needs? The truth is it has everything to do with your real, down to Earth, physical life experience. When you remember who you really are, and reconnect with those qualities in yourself that are powerful and creative, it will transform how you think, feel and act in the world. In short, it will change everything. Remember we said that the brain receives signals and transforms them into images and feelings that we experience as physical reality? If the Heart is your connection to Source, and the Heart sends signals to the brain, what do you think will happen when you create a Mind With Heart? Creating a Mind with Heart enables you to access that perfect image for your life that we call "Heaven", and the Heart will send signals to the brain that cause it to create your personal "Heaven on Earth" - a physical life experience filled with gratitude, joy, well being and infinite abundance. That said, you might now be wondering how long all of this is going to take? Well, that's really up to you. In my own experience I have seen things in my own life and other's lives transform almost instantly. 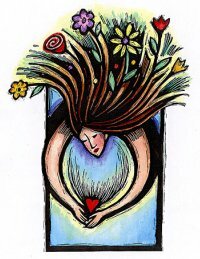 Other times it takes multiple efforts and some work to deactivate the beliefs blocking the manifestation of the Heart's desires. As long as there are still some things in your physical life experience that you perceive as separate, threatening, evil or just unpleasant then you still have some work to do. But perhaps that's our real work here. To take what we have created and transform it into Heaven on Earth. Or if not, perhaps accessing Source will give us the wisdom we need to truly understand our physical life experience and what we are actually supposed to do with it. Either way, a Mind with Heart is better than a Mind without One (no pun intended, but it came out that way so I'm going to leave it!). Finally, my life is not perfect. Or maybe it is and I just don't realize it yet. Either way, I would not be without what I am going to teach you in this Course. I believe it has saved my life several times. And I am sure once you try it you will probably agree. Connecting to Source may not instantly solve all of your problems all at once. But it certainly gives us access to infinitely more re-sources than we would have if we did not. Thank you for reading "In The Beginning". 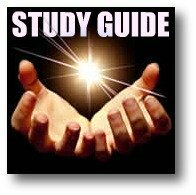 In my Course - The Total Heart Mind Body and Soul Makeover - I will talk a bit more about the nature of your physical life experience, the problems and circumstances you encounter in your daily life, and how you can start using what you already have to identify the thoughts and feelings your brain is using to create them. Once you identify them I can teach you some actions you can take to deactive them, and replace them with the images and feelings in your Heart and the life that God, Source, the Creator (You) have been patiently waiting to give yourself. If you think that you've heard this all before and that you have tried positive thinking, affirmations, vision boards, mind movies and the like and none of it worked - I assure you this will be nothing like that. The problem with Law of Attraction is that is only operates in the Illusion of Separation. After all, how can you attract something if you are not first separate from it? The Law of Creation recognizes that everything already exists in the Mind, but not all forms are given substance or made material in the Mind. In The Heart Mind Body and Soul Makeover you will learn how to direct the Mind to give substance or physical manifestation to the perfect images stored in your own Heart, and not the distorted images of your Ego Mind which believes you are separate, powerless and alone. Thank you for creating A Mind With Heart and bringing more joy, peace, health and prosperity to our world!